Out of Breath [Book Review] – my books. my life. Kat, a runner who is literally on the run, returns to her hometown of Lithia, Oregon with nothing except the clothes on her back. She befriends a woman and her fiance who give her a job at their running store and a place to live. She soon finds herself attracted to Roman, a mysterious actor while also attracting the attention of Alex, who warns her to stay away from Roman. Kat has found a place she thinks she can finally call home, tragedy strikes. Running. Vegans. Vampires. You can see why I picked this one up, right? It is hard not to compare this book to Twilight. New girl moves to a small town in the Pacific Northwest where she is attracted to two boys who hate each other. And there are vampires. But Out of Breath has a bit more depth. By presenting vampirism and veganism side by side, the book poses a philosophical question for all of us: do we take the lives of lesser creatures to strengthen ourselves? While at times a bit preachy – there is a scene where Kat argues for her vegan diet with Roman that was a bit over the top (especially when she then reaches for her wine which I’m sure is not vegan) – there is still an entertaining story going on. And I really enjoyed the running culture that provided the basis for much of the character interaction (although it made me long for my pre-pregnancy running days). 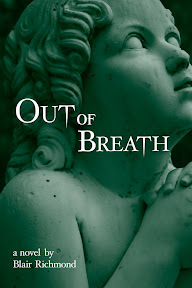 If you’re looking for something a bit different in your next vampire book, Out of Breath might have the unique twist you want. Just keep in mind that it is the first in, yet another, series. Interesting cover. I’ll keep an eye out for it. I had no idea that wine wasn’t vegan. This does sound a little more unusual than most of the vampire novels out there, and I actually love the vegan perspective. Might be something that I should check out. Great review on this one today! I am glad that it kept you enthralled and that it was a good read for you. On the wish list it goes! Thanks so much to Michelle for such a thoughtful review of Out of Breath! Pingback: The Ghost Runner [Book Review] | my books. my life.